Pharmaceutical Name: Pericarpium Citri reticulatae. Botanical Name: Citrus reticulata Blanco (Fam. Rutaceae). Part Used & Method for Pharmaceutical Preparations: After tangerines ripen in autumn, the skins are collected and dried. Functions: 1. To regulate qi in the spleen and stomach; 2. To dry dampness and resolve phlegm. 1. Qi stagnation in the spleen and stomach manifested as epigastric and abdominal distension and fullness, belching, nausea and vomiting, poor appetite and diarrhea. Tangerine peel (Chenpi) is used with Bitter orange (Zhiqiao) and Costus root (Muxiang) for epigastric and abdominal distension and fullness, with Fresh ginger (Shengjiang) and Bamboo shavings (Zhuru) for nausea and vomiting, and with Pilose asiabell root (Dangshen) and White atractylodes (Baizhu) for poor appetite and diarrhea. 2. Dampness blocking the spleen and stomach manifested as fullness and stifling sensation in the chest and epigastric region, poor appetite, lassitude, diarrhea and white and sticky tongue coating. 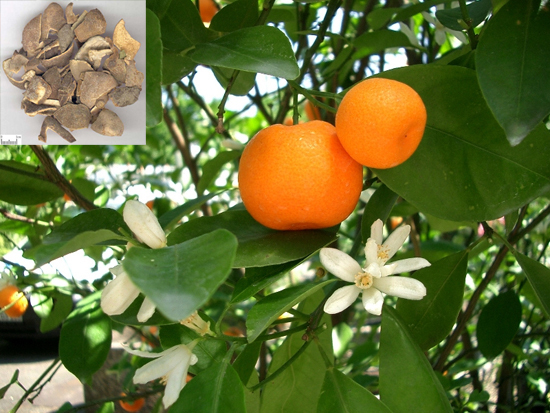 Tangerine peel (Chenpi) is used with Atractylodes rhizome (Cangzhu) and Magnolia bark (Houpo) in the formula Pingwei San. 3. Excessive dampness, deficiency of the spleen and turbid phlegm blocking the lungs manifested as cough with profuse sputum. Tangerine peel (Chenpi) is used with Poria (Fuling) and Pinellia tuber (Banxia) in the formula Erchen Tang.